Try our Oregano Hot and Spicy in your Mexican dishes for extra spice. Take regular oregano add peppery flavor and you have Hot and Spicy Oregano. Perfect for Mexican dishes and other Latin dishes. Add sparingly to taste. 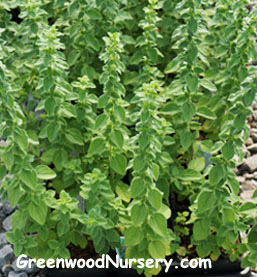 As with regular Oregano, the Culinary Herb Hot and Spicy Oregano grows in well drained sandy soil in full sun to part sun. Pink blooms arrive in summer just in time to attract bees and butterflies. The leaves of Hot and Spicy Oregano can be used fresh, dried, or frozen. To freeze herbs, use an old fashion plastic ice cube tray. Chop the leaves and place about a teaspoon full in each cube. Fill the cube about half full with water and freeze. Once cubes are frozen solid, pop out the cubes and store in the freezer in a freezer zip bag.